Tag Archives for " Derrick English Jr. "
In the movie Field of Dreams, Ray Kinsella played by Kevin Costner constantly hears the saying “If you build it, they will come.” Spoiler alert, if you have not watched the movie, the prophecy did come true and people showed up to play or watch baseball on the field that Ray created. Unfortunately for small business owners, like myself, I do not have the huge budget to promote my product or service like Universal Pictures can, or have not mastered the versatility as Kevin Costner. However, we as small business owners are talented in the work we do and have built a great product or service but have not received the traffic as we expected. The disconnect lies in the fact that we may struggle to communicate the value of our products or services in ways that compel people to buy it. We constantly fall into the traditional marketing trap of thinking we must pressure our customers to buy now, buy now, don’t miss out, don’t miss out – it is all about me, me, me, me – you can only get this from me. We have to realize that it is a global marketplace where our customers can shop around not just in our city, state or country, but anywhere in the world. How about instead of pressuring our customers, we try working on nurturing and gaining trust from our customers until they are ready to buy from us. A 2016 Content Preferences Survey Report stated that 47 percent of respondents (B2B) indicated they viewed three to five pieces of content before engaging with a sales rep. In today’s consumer market, it is clearly better and not a waste of your sales reps’ time to provide the needed content to answer your consumers’ questions and guide them along the buyer’s journey. And when they are ready to buy, they would purchase from you because you gained their trust with the expertise and credibility you provided in your content. To get to this end goal, let us look at the five tips you must understand and work on. SEO copywriting is all about crafting content so compelling that other people want to promote it by linking to it or sharing it, which increases your trust and authority and helps pages you want to rank well for certain keywords. Engaging readers to build trust and authority. Using keywords to help search engines understand what the content is about. To make this work for your business, SEO copywriting must contain quality content. PERIOD! When we use Google, Bing, Yahoo or any other search engine, what do we do? We type words into the search box to find an answer to our question. Some are short and some are long but search engines can decipher the keywords to find authoritative content that answers our questions. It takes time and investment for small businesses to compete with larger companies that have plenty of traffic and higher trust and authority from search engines on short keywords. e.g. What do you think would be a better keyword for Linnaeus University to target potential exchange students to learn Swedish there? The short keyword phrase ‘swedish language course’, where the university is competing with online courses, municipalities, community colleges, etc. for high rankings. Or the long-tail keyword phrase ‘swedish language course for international students’, where the university has less competition with only other universities. We highly recommend that you focus on using specific long-tail keywords to gain trust and authority to differentiate yourself and attract better-qualified leads who are more interested in buying your product or service. 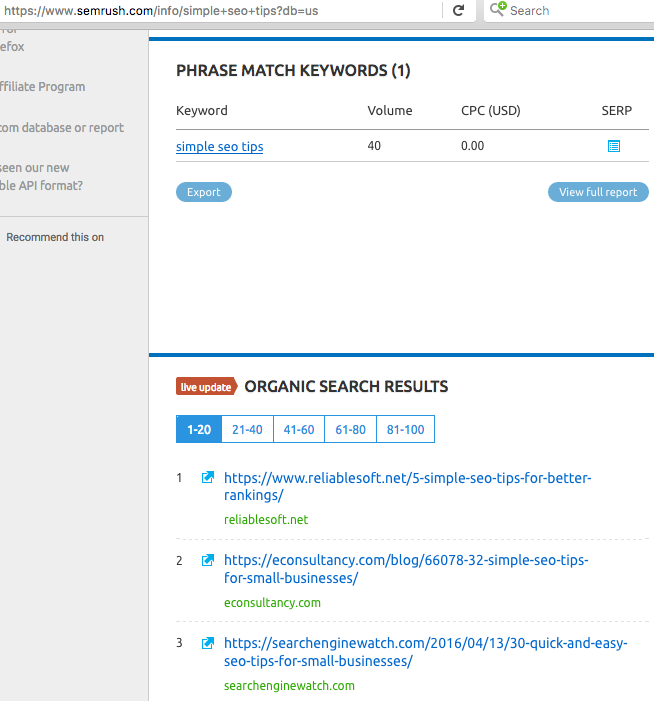 Using a tool such as Google Keyword Planner, you will be able to find the long-tail keywords that interest your buyer personas and see the competition level and other relevant keywords to use. If you look at our title ‘5 Simple SEO Copywriting Tips For Small Businesses’, can you figure out what is the long-tail keyword that we are using? If you stated ‘simple SEO tips’ then give yourself a pat on the back. You may say that I am only getting around 40 searches per month with the keywords, but to our small marketing agency those are the quality leads we are aiming for. To go more in-depth, you can use more user-friendly tools that will provide you a better recommendation for specific website keywords or tools that provide you research on your competitors’ keywords. Use the information to get started and compete with them, while finding relevant keywords not being used by your competition to stand out. The rule of thumb to remember is to make sure your title provides a clear description and your keywords are contained in it. The keywords are an important factor for search engines to know if a page does contain the information that the consumer searched for. It is a good bet to keep your titles between 50 to 60 characters to make sure they display properly on your consumer’s preferred device. 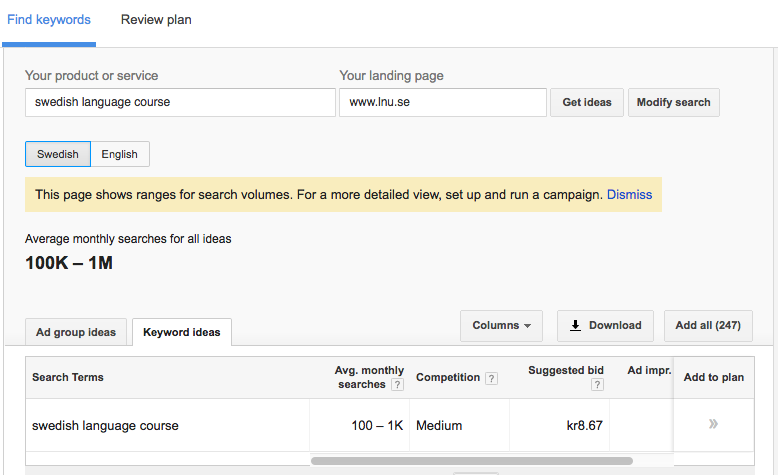 The meta description tag on a page does not affect SEO ranking. However, the keywords do show up in the search results that can benefit you. As you can see from the image above, when I typed in Europe’s greenest city, the keywords in the meta description appeared and they are bolded to draw attention. Think of meta descriptions as important secondary information that searchers would read before deciding to click. We can assume that search engines are using top-notch algorithms to verify if the body of your text is relevant to the keywords used in the search. This means that you should play the quality route and provide meaningful content that your visitors are searching for and show them why you are the subject matter expert on this topic. If you view the Periodic table of SEO Success Factors by Search Engine Land, you will see that majority of the elements in the Content column focus on the quality and substance of the content on the page. Keyword frequency is the number of times a keyword or phrase appears on a page. It is an SEO best practice to only use keywords when relevant and focus more on answering your consumer’s question. By practicing keyword stuffing you will force visitors to exit right away, which will increase your bounce rate, and it will be only a matter of time when it will give a negative effect to you in the search engine rankings. Providing useful links to other relevant topics internally or externally that a visitor can find useful is just another reason why you are an awesome Good Samaritan. Knowledge should be shared and you can believe that the search engines are rewarding you for links to quality pages. Keep in mind relevant links because having a page that is about the Best Ski Resorts in Sweden and then having an external link to Legoland, just to benefit from their high ranking authority, will not sit well with your visitors or search engines. If you do not know who your real audience is, can you really create great content? If you want to gain quality authority in rankings you need to not just assume who your audience may be. You need to be able to have buyer personas that explain your customers’ problems, role, and concerns to be able to create content that resonates with them. e.g. Marcus Sheridan’s pool company was hit hard by the recession in 2008 due to the financial crisis in the US, and the company turned it around by answering their customers’ questions which have to lead them to receive the most web traffic in their industry because they know who to write their content for. By shifting your view of your targeted audience to actual people with specific interests, wants, and needs, you will be able to find better ways to serve them. If you want to make content stick in your consumer’s head, then tell a great story. We are drawn to stories that allow us to use our imagination, have characters and situations that we can relate to, and think about the possibilities of what may come. If you think about it, the success of any brand is linked to our emotions. Why do you like Coke over Pepsi, iPhone over Android? It is because of the emotional connections you have with the content that these brands provide you. e.g. Thea from Rosendals Honung gave me a great experience at MatSmåland this past September. I was observing their honey products when she probably noticed that my hands were ashy and stated besides honey, beeswax cream is great for the skin and it is thick enough to keep your hands moist even if you wash them. As an African American, I am usually shy so I connected with her message about keeping my hands moist. Then she stated ‘do you mind, would you like to try a little bit’ and I stated ‘sure’. Let me tell you it felt amazing on my hands and I said right there, ‘you made a purchase and if this product holds up to your story about keeping my hands moist after a wash (which it does), you now have a loyal customer’. I remember that experience and the details because a great story makes consuming the content much easier to their customers. Storytelling is valuable and necessary because it gets your content read and shared amongst others if done properly. Reference Moz’s On-Page Factors for best practices when it comes to on-page SEO, and have the keywords in your title and domain name. Starting off, over 70% of your web page ranking can be contributed to activities that are performed outside the boundaries of your website, which are called off-page SEO. Link building – by receiving backlinks to your web page, it is a vote of confidence that tells search engines that others find your web page relevant. The more backlinks you receive, the higher your page will rank. Reference Jeff Bullas’ ‘6 Simple Tips to Rank High in Google Search Engine’ article about ways to receive quality backlinks. Social media engagement – social shares are a sign of popularity amongst the general public which search engines are now using social engagement as one of its ranking parameters. Online reputation management – having low-quality backlinks can affect your ranking and it is a part of your job to remove them. You can use Google Search Console to see other websites linking to your website and use the Disavow Links tool to remove any low-quality sites. For legal reasons, make sure your off-page SEO activities follows white hat SEO practices and not black hat SEO practices that can get you penalized. If you take the time to do research and provide quality long-tail keywords and content that interest your buyer personas, answer their questions and drive people to promote and share your content – you will sooner rather than later start seeing your pages be ranked higher on search engines. By ranking well in search engines, you will increase your organic traffic without having to spend a lot on paid advertising to compete with your competitors. Yes, link building does make up the majority of SEO ranking and allows you to reach out to a wider audience. However, if you put your efforts in providing great content and promoting it correctly, I am 100% sure that ‘…, they (increased organic web traffic) will come’. If you follow these five steps that I’ve outlined above, you will see increase organic traffic and ranking for your web page’s content. What techniques do you use to optimize your web page content? 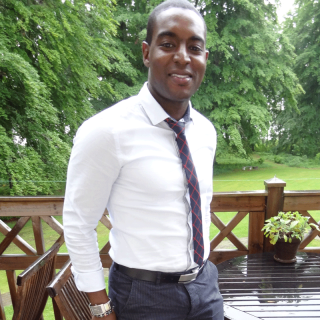 Derrick English Jr. delivers measurable inbound marketing services that generate quality leads through SEO, social media, and content marketing as the CEO at DLE Solutions in Växjö, Sweden. No matter the marketing challenge you are facing, he can find a quality solution that will engage your audience and grow your brand. Follow his agency’s journey on Twitter, Linkedin or Instagram.